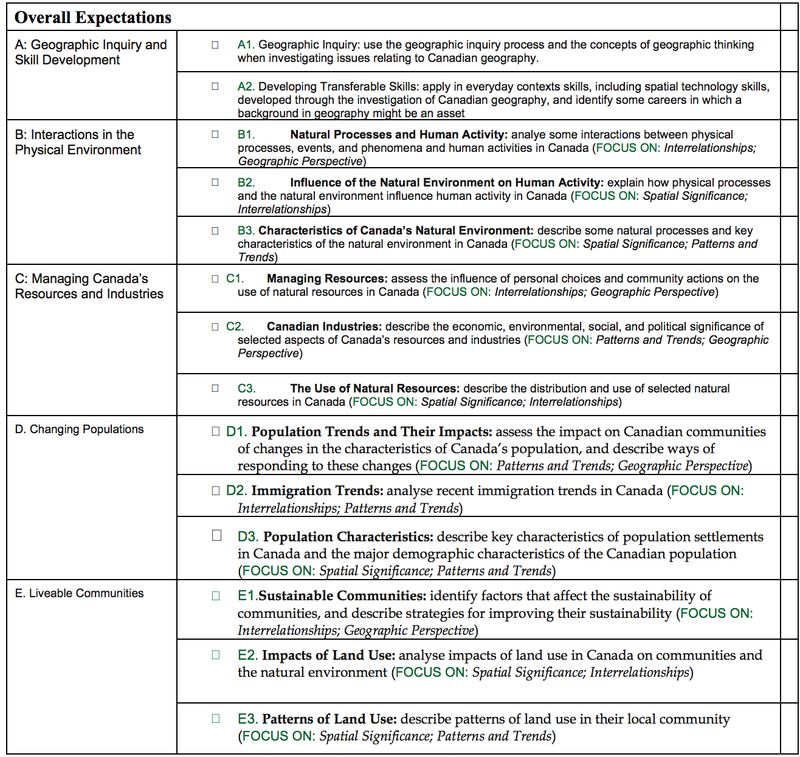 Course Description: This course focuses on current geographic issues that affect Canadians. Students will draw on their personal and everyday experiences as they explore issues relating to food and water supplies, competing land uses, interactions with the natural environment, and other topics relevant to sustainable living in Canada. They will also develop an awareness that issues that affect their lives in Canada are interconnected with issues in other parts of the world. Throughout the course, students will use the concepts of geographic thinking, the geographic inquiry process, and spatial technologies to guide and support their investigations. Students will be able to identify the parts of a map. Students will be able to explain how the Earth is divided into hemispheres and how we use degrees to tell where we are on the Earth. Students will be able to describe methods of mapping the Earth, such as UTM and GPS. They will be able to explain what contour lines are and what they communicate. They will be able to make a map using a title, legend, scale, colour, compass rose, symbols and other appropriate pieces of information. Students learn to identify topographic maps to learn about the diversity of Canada’s landscapes. Students will be able to describe the basic structure of the Earth, it’s formation and constantly changing condition. They will discuss how and why the Earth is a dynamic and changing place, with references to forces of change such as tectonics, glaciation and erosion.They will also identify the various parts of structures such as volcanoes and glaciers. Students will learn processes of erosion and its effect on the Earth. They will also learn how natural disasters such as earthquakes occur and describe the impacts and safety tips for surviving such an event. Finally, they will be able to describe how climate change is occurring and how this change is connected to natural disaster. Students will be able to Identify and name each of Canada’s 8 climate regions. They will learn the characteristics of each climate region. They will be able to explain how climate regions vary across Canada. They will also learn how climate in each region has an influence on human activities. Students will examine Forestry, Energy, Climate Change, Fisheries to identify trends, issues, and connections in Canada's industries. They will investigate how the way that our resources are used impact on the availability of resources in the future. They will also investigate how people have different points of view on how Canada’s natural resources should be developed.